Most developed countries with relatively high fertility rates around replacement level (2,1 children per women), like France or the Nordic countries, have a comprehensive mix of different family policy instruments. The reason why these countries have been experiencing a re-increase in fertility rates over the last decade cannot be attributed to one single family policy measure such as cash benefits, but the whole policy setting and its interactions with labour market participation and gender equality has to be considered. It is true that countries like France or Sweden have relatively generous child allowances (lump sum cash transfers), but other instruments like child care subsidies or parental leave pay are even more generous and even more important. In general, we can observe that countries which privilege cash transfers against child care or parental leave, such as Germany, Italy and many Eastern European countries, have relatively low fertility rates (around 1,4 children per women). Giving pure financial incentives to parents, in the form of monthly cash transfers or generous birth grants, seems not to be a fruitful way to increase fertility. What seems to work more is offering parents the possibility to combine work and family life. In high fertility countries such as France and Sweden, most women, even the highly qualified, work and have children at the same time. 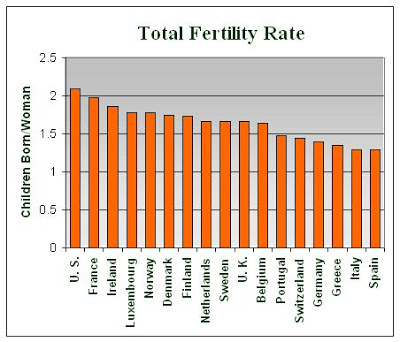 In low fertility countries such as Germany, Austria or Italy, women either work or have children. If they have children, many women work maximum part time. It is rare that women with young children work full time in these countries. The dichotomous choice between having children and pursuing a career results in the fact that many high qualified women postpone childbirth (they often have their first child after the age of 35) or do not have children at all. This reduces total fertility rates. Policies can of course help these women to achieve a better work-life balance. By this indirect means, family policies are able to increase fertility rates, whereas pure pronatalist policies such as birth grants are unlikely to increase fertility in the middle and long run. How can family policies increase the work-life balance? France and Sweden for example invests a lot in an area-wide child care system. The child care coverage rate for the youngest children below the age of three is above 40% in both countries, whereas in Germany and Austria the rate is only around 15%. In France, public child care, ‘crèches’ (nurseries), nannies and child miners, are generously subsidized and children go to an all-day school from the age of three on. In Sweden, parental leave provides parents a 80% net wage substitution during the first 12 months after childbirth, which encourages parents to work before childbirth, to return to the labour market shortly after childbirth and to share tasks among parents. Together with cash transfers for parents with low income, child care and parental leave can contribute to a comprehensive policy mix facilitating parents’ work-life balance. Over and above, family policies are all the more efficient if they go hand in hand with labour market and gender equality policies encouraging women’s careers (mentoring programs, quotas, correct working conditions after return of maternity or parental leave etc.). By encouraging women’s work-life balance, family policies can not only succeed in fulfilling pronatalist objectives. By increasing female employment, they can also reduce income poverty, increase gender equality, create tax income, and by all these means support child development and prevent population aging. Angela Luci-Greulich, Assistant Professor in Economics at Sorbonne University, Paris, France. A. Luci-Greulich, O. Thévenon (2013): “The impact of family policy packages on fertility trends in developed countries.” European Journal of Population, July 2013. This entry was posted in English articles and tagged Angela Greulich, Angela Luci, birth grants, cash transfers, child care, European Journal of Population, family policies, gender equality, gender quota, low fertility, maternity leave, mentoring, Olivier Thévenon, parental leave, population aging, total fertility rates, work life balance. Bookmark the permalink.